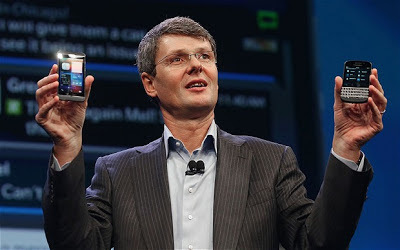 BlackBerry is attempting an Apple-like company turn around, which is by no means, an easy thing to do for any company. A recent article said that BlackBerry doesn't need to beat out iOS and Google Android hands down right now, rather the BlackBerry 10 OS needs to be able to hold it's own to iterate and mature. Being a long time Palm fan, I have observed similarities between the transformation RIM is currently undertaking with BlackBerry 10 and the Z10 and Palm's transformation from Palm OS and the Treo to webOS and the Pre and the launch of the Z10 in the UK is just another parallel. "That’s the good news. Sue tossed some cold water on the report though, noting very short Z10 inventory across all of the stores he spoke with. “Supply appears limited, with stores allocated avg. 5-10 units/store for walk-ins and est. 20-30 units/store for pre-orders,” the analyst wrote." Huh. You know what other device was the best selling launch day device with sellouts across the board? Well, yes, the last iPhone, but I was specifically thinking about the Palm Pre with webOS on June 6, 2009. The Palm Pre for Sprint was selling out all over the place. Which is easy to do when each store received less than 24 devices each. We all witnessed Palm's sad, slow demise, and I have to wonder if the new BlackBerry Z10 and Q10 are the new Palm Pre and Pixi. For BlackBerry fans and customers, let's hope not.